When you’re car shopping, you look for a car that’s both reliable and fits in your budget. However, you may also subconsciously be looking for a vehicle that is an extension of you. When you own that “perfect” vehicle, you need to properly care for and maintain its condition – both inside and out. By taking care of your vehicle, you ensure its longevity. Here’s the reality: some car repairs are done out of necessity because of normal wear and tear. Other repairs are made because you failed to care for the vehicle as you should have. With the right kind of car, you can reduce or never have to make many kinds of vehicle repairs. In the end, you save yourself a ton of money. The external body of your vehicle is under attack on a constant daily basis. It’s dealing with road surface chemicals, dust and insect remains. Did you know that all this could corrode the paintwork, causing excessive damage to the body? How do you stop this from happening? Regularly washing your vehicle means you get rid of these damaging agent and maintain its protective clear coat. You also keep it from corroding and discoloring. While this doesn’t happen overnight, it’s imperative to regularly wash your vehicle to get rid of contaminants that eat away at the protective coating and vehicle body. Do this, and you can ensure your vehicle’s paintwork stays high-quality as the day you bought it. You can also opt for the additional rust protection many auto manufacturers also offer to protect your vehicle. Your vehicle interior also needs protection from contaminants like dust, which comprises of both chemicals and grit. When you clean the inside regularly, you stop any dust from building up. Vacuum the carpet and seats thoroughly, getting rid as much dust, dirt and trash as you can. Clean off the dashboard using hot soapy water and washrag. For vehicles with leather seats, treat the leather often to ensure it’s an optimal condition. There are also specific cleaning formulas for the underside of your car, which help to break down the contaminants and dirt. New cars come with an under seal applied to their underside which will last for a number of months. There are a number of under seal products that you can purchase and apply to the underside of your car that can stop help the buildup of contaminants. Cleaning your car’s motor may seem a daunting thought but with the correct materials and preparation, it can be a worthwhile task. By cleaning your motor regularly, you can ensure that grease and debris do not build up which can lead to problems such as corrosion, which in turn can lead to expensive repair bills. 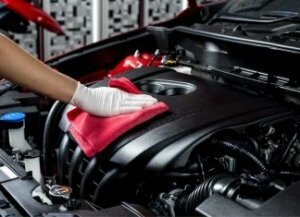 There are a number of cleaning products available for cleaning your motor and it is important to ensure that you research fully how to prepare and clean your car’s motor. Your car’s motor contains a number of components that water should not touch or enter, so it is vital that you take the time and research fully the way in which you should prepare for and how you undertake a motor wash.